Army Lt. Gen. Darsie Rogers, left, Defense Threat Reduction Agency deputy director for combat support, applauds after awarding the Medal of Valor to Michael Anthony Dunne, William Timothy Nix and Brandon Ray Seabolt at the Pentagon, Aug. 14, 2018. The men, who are all retired Soldiers, were recognized for their actions against an armed enemy while serving as civilian contractors in Afghanistan. Three retired Soldiers were honored at the Pentagon Aug. 14 for exceptional gallantry in action against an armed enemy while serving in Afghanistan as civilian contractors. Retired Army Master Sgt. 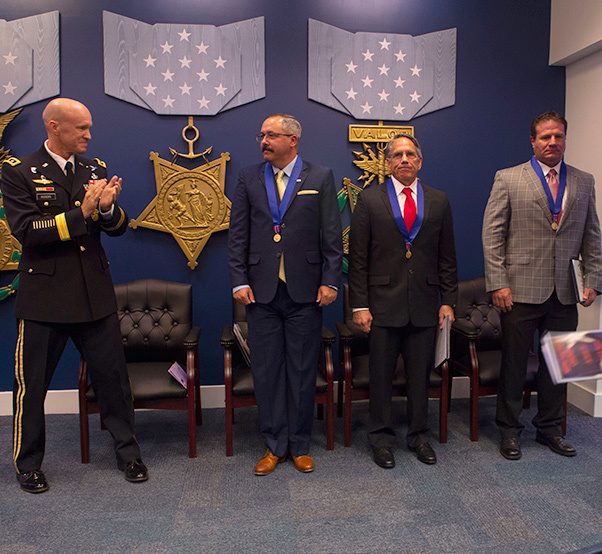 William Timothy Nix, retired Army Chief Warrant Officer Michael Anthony Dunne and retired Army Chief Warrant Officer Brandon Ray Seabolt received the Medal of Valor, the Defense Department’s highest civilian award for valor. Nix was working as a civilian contractor at a coalition base in Kabul, Afghanistan, Aug. 7, 2015, when he heard the massive boom of a vehicle-borne improvised explosive device. “I just grabbed a weapon and ran out,” Nix said. Insurgents had breached the entrance at Camp Integrity, launching the deadly attack with a vehicle-borne IED and then using direct fire, hand grenades and suicide vests. Nix and Dunne, a fellow contractor, rushed to the fight, teaming up with military personnel to defend the camp, suppress the enemy and evacuate the wounded. “[The insurgents] blew the whole front of the camp. The gate came off. It collapsed the guard tower out there,” Dunne said, recalling that a suicide vest exploded 30 feet away from him. He thought he would die, he said, but he kept fighting. Nix was serving as an irregular warfare analyst for the NATO Special Operations Component Command-Afghanistan in support of the Resolute Support mission. Dunne was an operations intelligence integrator there. Fighting was intense and the situation was chaotic, they recalled. Army 1st Sgt. Peter “Drew” McKenna Jr., who was leading the charge against the terrorists, was killed, as were eight Afghan contractors. Their citations laud their heroism for exposing themselves to direct enemy fire, hand grenades, suicide vests, and other explosives to suppress insurgents who had breached the camp. Their actions undoubtedly saved countless lives at great risk to their own lives, their citations read. Seabolt received the Medal of Valor for his actions in response to an attack near Helmand on Dec. 17, 2015. He had spent 22 years in the Army and was serving as a civilian contractor and counter-IED expert with the Joint Improvised Threat Defeat Agency. Then, the withering, close range, semi-automatic and automatic fire from the enemy began. “We entered the compound with about 10 people, and there were two of us left in the fight,” he recalled. Two Afghan commandos were killed; the others were wounded. Seabolt’s citation lauds his exceptional actions in exposing himself to enemy fire and suppressing the insurgents so Afghan commandos and U.S. Special Forces could move forward. He single-handedly fended off the insurgent onslaught until the return of other team members, it reads. “Mr. 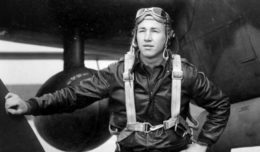 Seabolt’s bravery and confidence instilled courage among the entire force, resulting in effective fires on the target, softening the objective and allowing the recovery force to approach with little resistance,” according to the citation. Army Lt. Gen. Darsie Rogers, the Defense Threat Reduction Agency’s deputy director for combat support, said he is honored and humbled to call the men American heroes, and partners and colleagues in service to the nation. “We honor these three men for the remarkable valor they exhibited on the battlefield, for reminding us of the awesome power of the human spirit and for symbolizing the fearless determination of great warfighters,” he said. The men, who are all former special operators, exhibited the very best of what it means to be a servant and a citizen-warfighter, he said. “Each of these award citations serves as a moving testament — and a fitting reminder — that the work being done by those who fight on the front lines and protect us all is exceptional, essential and extraordinary,” Rogers said.